Admit it. You’ve fallen for something. Somewhere down the line, there was some skincare product that was claiming to work miracles on your skin, and you fell for it. After all, the commercials made it sound so good! There were all these “before” and “after” pictures, and they looked so realistic. The after pictures weren’t making any huge claims – the ladies still had a few small lines here and there, but, hey, you could live with that, right? That was all you were asking for — skin you could live with — that couldn’t be too much to ask, could it? Apparently so, because when you bought it, the product did nothing to help your skin, and it may have even ended up making your skin look worse. Or what about the old celebrity ploy? They put your favorite celebrity on the commercial, and you say, “Well, this has to work!” She (said actress) would never deceive me! She’s so nice and funny on that sitcom.” Well, they are actresses, aren’t they? Or what about the science ploy? That’s when they put some certified dermatologist showing off all his impressive credentials on the commercial explaining to you how the product works scientifically with your skin to fight signs of ( insert preferred skin issue here.) I would say this is the one that got me, sort of. Maybe I should go back in time a little. My mother aged very late in life. I grew up with a twin sister and, almost without fail, we would walk into a store, or restaurant and someone would ask if the three of us were sisters, much to my mother’s delight and my sister’s and my annoyance. However, I grew up expecting the same. My forties would be my new twenty. Unfortunately, by some cruel joke of nature, this did not happen. As soon as I was 28, I began to notice the wrinkles in my forehead were becoming a little more of a permanent thing, and that was just the beginning. By the time I was in my early thirties, I’d developed smile lines around my mouth and my forehead had worsened. This was so unfair; I had thought that the comments about being the same age as my mother would stop at some point, but apparently it was now I who looked older rather than she who looked younger. I definitely needed to act quickly. Of course, I started at the closest and cheapest place: the pharmacy, but I soon learned that there was a lot more to skin care than just rubbing on some anti-aging moisturizer, there were huge stores of information about skincare. There were blogs, shows, infomercials, YouTube tutorials, in fact, women had been obsessed with skincare since time immemorial. This was big business. You had to be educated about what you bought. That’s when I first began hearing the word “retinol.” At this time, I had blind faith in Dr. Oz. This was when he was still on the Oprah Show. He seemed genuinely passionate about his work, and was not afraid to defy conventions, a characteristic which I appreciated in all people. “The only ingredient that actually make wrinkles disappear is Retinol” ( or something along those lines). The Great Oz had spoken. Other ingredients might moisturize skin, they might make it more radiant, but only retinol could actually remove wrinkles! Now I had some sort of insight! It would be simple! I would just find something that contained retinol and put it on my skin, and I would return to my youth! However, the price tags were a deterrent. Here I was paying ten dollars max for my skin products, and there were companies charging up to $500 for a jar of retinol enhanced skin treatment. Of course, there were the pharmacy versions, but it didn’t take me long to find out that you, at least to some degree, get what you pay for. The search was on. I needed to find a reasonably priced retinol-containing product that actually contained some powerful retinol. I decided I could increase my budget a little if it really worked. After all, my youth was definitely worth a little investment, but $500 was a bit steep for me. Unfortunately, I discovered that even when I doubled my skincare allowance, I wouldn’t necessarily find anything much better than the old pharmacy offered. Apparently, all retinol skincare products were not created equally. That’s when I decided to do a little more research on the subject. I soon discovered that there was more to choosing a trustworthy skincare solution than the word “retinol” on the jar. First, it depended on the concentration of the retinol. According to experts, the retinol ingredients had to be listed as one of the first ingredients on the ingredient list. Otherwise, you probably didn’t have enough to make a difference. Plus, you had to look at the other active ingredients. Did it have any retinol boosters to enhance the efficiency of the retinol? What was the percentage of retinol in the product? How had finding a good retinol complex become so complex? And, as if that weren’t enough to consider, there was also the fact that retinol could be, and often was, too powerful for certain skin types. Too much retinol would dry out the skin, too little would do nothing. That’s when my mind turned to Vivo Per Lei. I really liked using Vivo Per Lei products because they far surpassed pharmacy grade in quality, but they were always reasonably priced and came with a few special touches, like a beautiful package or fabulous smell that made them a treat. I had used their hair care products before, and was always happy with the results. I always got a generous quantity of product, plus Vivo products were full of botanicals and natural ingredients, so I could rest assured they would never harm my sensitive skin. I thought it was likely they would have a retinol-based skin cream in their product line. 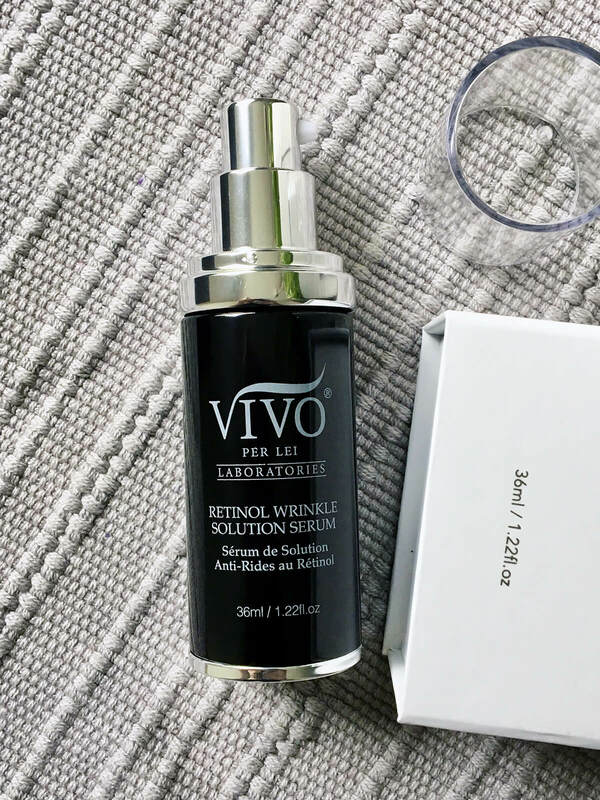 There were a few things about Vivo Per Lei Retinol Wrinkle Solution Serum that attracted me right away; mainly the fact that it was a serum. I had come to like serums because their smaller molecules allowed them to penetrate skin more easily than traditional moisturizers and they never felt greasy on my skin. The next thing I noticed was the form of retinol in the serum. Retinol is a derivative of vitamin A, and it comes in many forms in lotions and cream, all of which are of varying potency and efficacy. 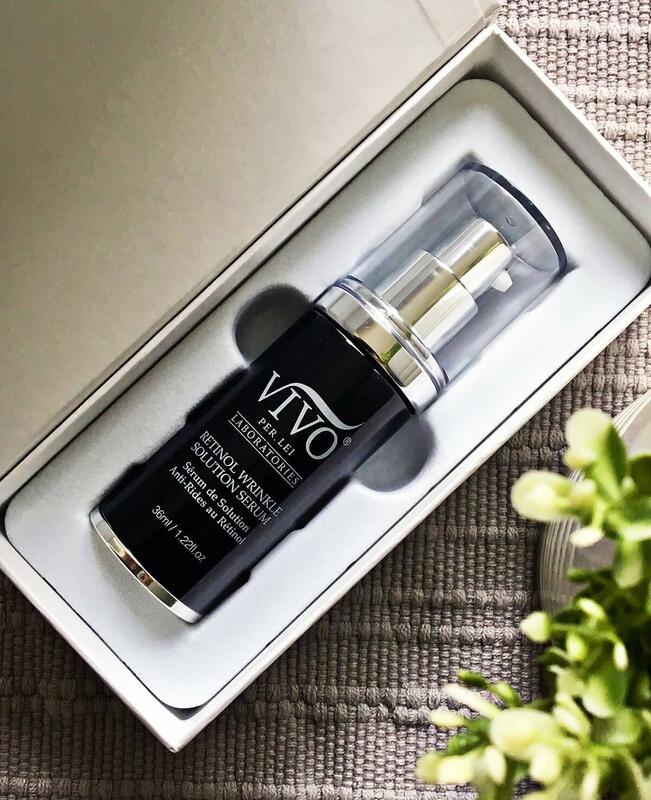 The Vivo Per Lei serum contains retinol in the form of retinyl palmitate, which is vitamin A combined with palmitic acid. Palmitic acid is a saturated fatty acid and major component of palm oil. It’s absorbed by the skin, and is one of the most important vitamins for the skin’s appearance because its small molecular structure gives it the ability to penetrate the skin’s outer layers and repair the lower layers where the elastin and collagen are. Another thing I liked about the Vivo Per Lei serum was its supporting ingredients. 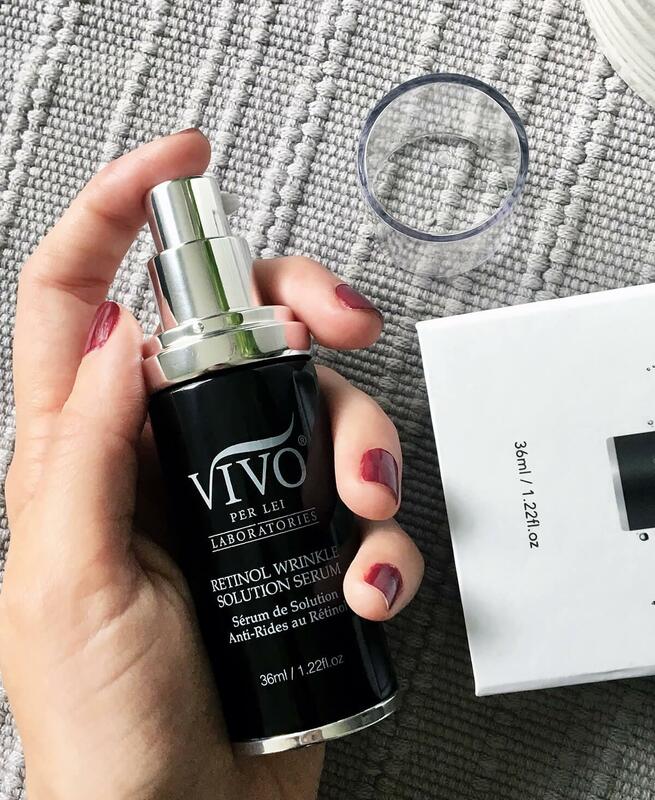 Besides the retinol, the Vivo Per Lei was packed with antioxidants and natural ingredients that I knew would boost the effectiveness of the retinol. It also had my old friend vitamin E, organic aloe, organic chamomile, organic green tea, and even some vitamin C palmitate. I was pretty impressed. But as they say, the proof was in the pudding, and I had yet to sample it. The Vivo Serum arrived in an elegant, sturdy, yet suspiciously recyclable looking box, which made sense. A company that values natural products so much would be environmentally concerned enough to use environmentally safe packaging. It also came in an attractive pump bottle, black with gold detailing, definitely vanity table display-worthy. The texture met my expectations to a tee. The formula was thin with a slight gel-like consistency, and it had that characteristic Vivo Per Lei “I’m expensive but worth it.” scent. It absorbed into my skin instantly, but the more pressing question was; would it do anything once it got to those bottom layers? 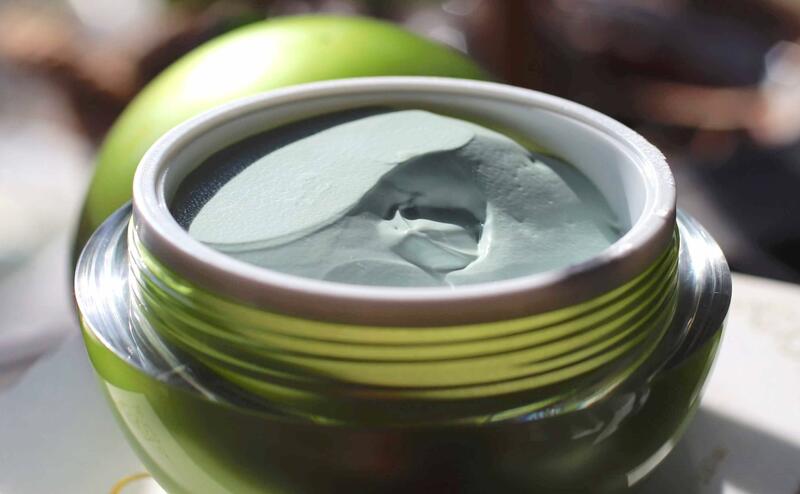 There are two crucial moments when applying a new skincare product. The first is when you first apply it, and the next is when you really see it beginning to make a long term difference (usually in about a week or two.) My first experience with the Vivo Per Lei Serum was quite satisfying. My skin felt immediately hydrated and noticeably less tight, and I noticed my wrinkles slightly soften in my face, but would they actually begin to decrease in appearance as Dr. Oz had promised? Obviously, we have to fast forward a bit, unless you want me to tell you about what happened when my mother came over the next week, but it’s kind of off the subject and a little bit boring, so let’s get back to the serum, shall we? The serum worked! Ok, so I didn’t look like I just had a complete facelift, but if I wanted that, I would have gotten that. However, what I did get was exactly what I was looking for. Remember how I said in the beginning that I just wanted skin I could live with? Well. that’s what I got. My deepest wrinkles still remained, but they softened a great deal, so I looked a lot happier and quite a few years younger, and it was enough. I was starting to feel human again. I realized my wrinkles had made me feel invisible. I didn’t feel like myself anymore, I was just another older lady doing my shopping. shopping or on my way to work. Vivo Per Lei let me reclaim my identity. I began to get more respect, more smiles, and even some looks of interest, if I may be so presumptuous, and even if my mother still looked like my sister, at least she looked like my “quite a bit older sister” now. So what’s the upshot? I would say, if you identified with any of what you just read, go get Vivo Per Lei right now. It’s not a miracle cure, but you will notice a difference, and so will everyone around you. The smell is clean and invigorating, it feels good going on your skin every morning, and you’ll feel it working to protect your skin during the day. It’s also extremely gentle. I never felt any stinging, any tightness, or saw any signs of irritation, and I would even say that applying it daily has been a pleasure. I may not be a celebrity, and I’m certainly not a doctor, and I’ve never been in an ad or commercial, but I can tell you that Vivo Per Lei Retinol Wrinkle Solution worked wonders for my skin, and it might just do the same for yours. Thank you so much for your detailed review! I have very sensitive skin & have avoided retinol products for my forehead wrinkles because I had heard that retinol could be too harsh for my skin. After reading your review I would be willing to try Vivo Per Lei Retinol Wrinkle Solution Serum. The older I get the more I think I need retinol in my life, this sounds so amazing! Thank you for the information. 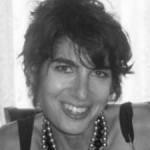 I have been researching products for anti-aging, butI shyed away because of the cost. This may be the product for me! This sounds like a great product to try. Im always looking for new skin care products to try. I trust a real person, like you with a realistic, yet positive sounding results review like you, over ANY celebrity any day. Any time I see a celebrity as a spokesperson for any product if anything I trust it less. I know darn well the celebrity was paid for every word and to say what the brand wants them to say. You sharing that you could see a noticeable improvement is actually very impressive to me because the majority of over the counter anti aging facial products you do NOT see an actual difference and just hope and pray it is at least slowing down the signs of aging or helping prevent more but can’t be certain. I really want to try some of these products! They all seem like they would be great for your skin! ! I love a good Retinol. There’s nothing that gives you such a healthy glow while also promoting skin-cell turnover and bashing wrinkles… and is scientifically proven to fight signs of aging. What’s not to love? Retinol palmitate is my favorite form as it’s based it oil and isn’t nearly as drying as other forms. This gel looks like a dream to apply,it definitely looks like it would have really great slip and not feel too heavy. I am so curious as to how this would work and would love to try it. Thank you for such an amazing and informative post-I really enjoyed reading it and I am looking forward to giving this a try. I don’t know much about Retinol. But believe it would help my skin issues. I keep hearing about retinol but now I understand its use on skincare. This product sounds great. I am impressed by the ingredients in this serum. 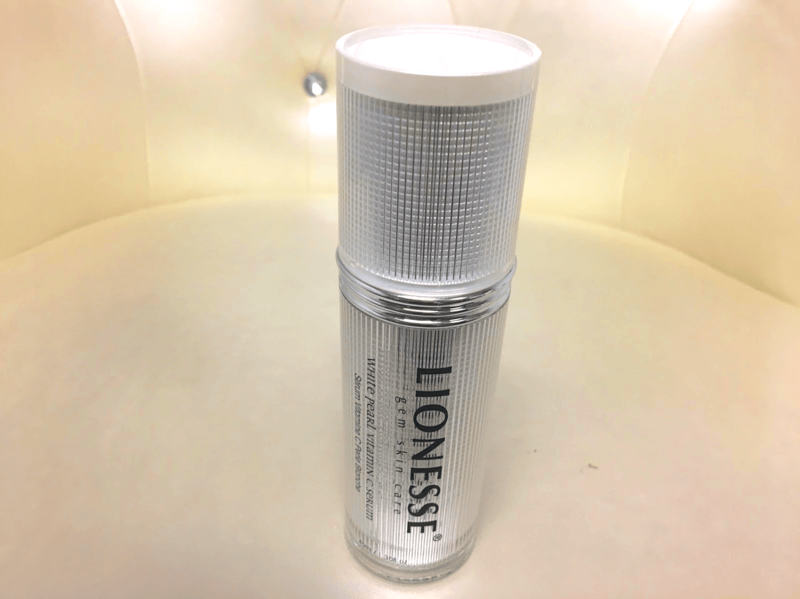 Could it be I’ve finally happened upon my retinol holy grail? I’ve been looking for a reasonably priced product to reduce the appearance of my wrinkles. Thank you for your honest review of this product. I really want try it. Thank you for your review of the Vivo Per Lei Retinol Wrinkle Solution Serum. This is exactly the kind of product I’ve been looking for! Retinol is imperative at my age — would love to try this serum. November 18, 2018 @ 6:19 am M. L.
It softened your wrinkles…so perhaps it would help postpone wrinkles for someone who doesn’t have many yet…? So convincing. Looks like just the right amount of retinol and supporting ingredients in this. A must try. sounds wonderful. Most other retinol products I have tried are very expensive. 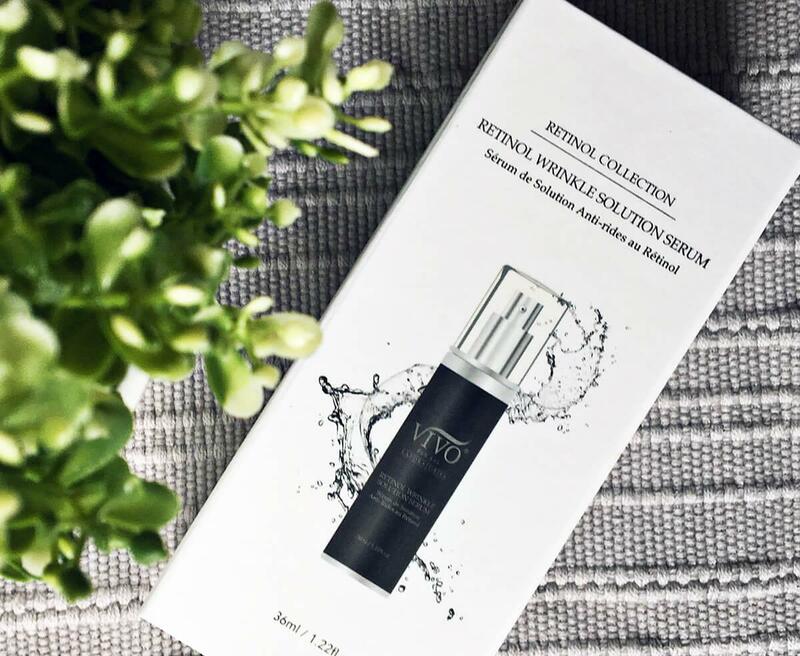 The review of Vivo Per Lei Retinol Wrinkle Solution Serum is empowering for women. 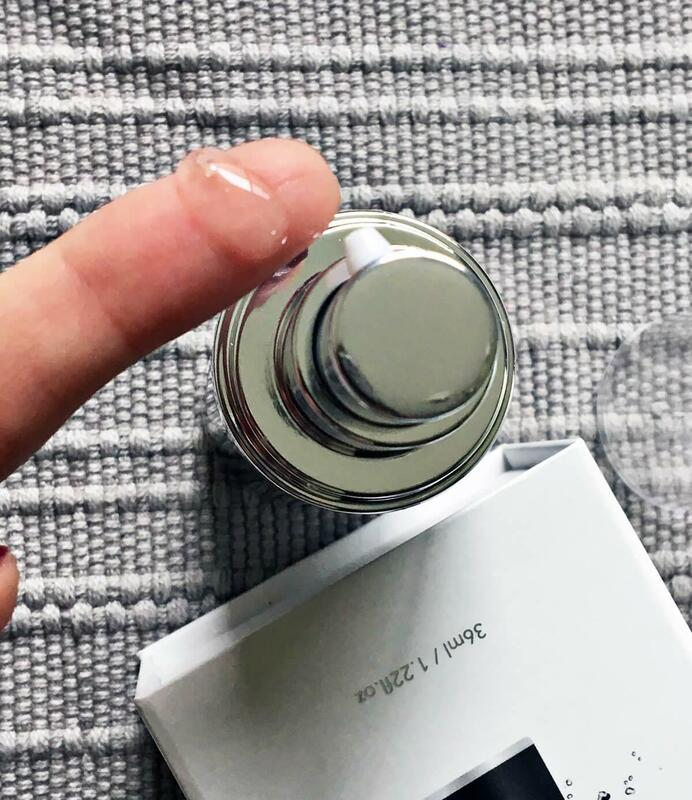 The review is an honest view of the product that sounds to be an answer to public enemy number one—-“THE WRINKLE!” I’m intrigued by the product and look forward to try it one day soon. I didn’t know that the retinol quality and concentration depends on your budget! I do like the ingredients in this Serum and I prefer serums over other forms as well. My skin is extremely oily and acne prone as a result I have to use prescription Tretenoin. The over the counter ones were not strong enough to help much, if any, with the oiliness and acne. As you stayed Tretenoin has to be used infrequently at first until the skin can tolerate the product without irritation. I did that respectfully and now am a daily user without any irritation. The product you reviewed does sound like an answer to prayer for those with sensitive skin. I am only wondering you said you use it in your daytime products . Do you also use it at night ? Thanks for a great review. I’d love to try this! Thanks for the review. I honestly can’t stand Dr. Oz snd his bandwagoning. Generally if he’s supporting it I steer away. I like the list of ingredients and the suggestion that the scent is enjoyable. I hate medical smelling face creams. Can’t wait to see how this works. December 1, 2018 @ 3:00 am Dawn D.
I could really use this on my neck. I need some for sure! December 3, 2018 @ 2:56 am Kimberly B. This sounds like a great product. I like that it is gentle for the skin. I love great skincare that is affordable. This sounds really nice! I love affordable skin care. I would love to try this. This product sounds so interesing. I would very much like to try it. My mother was blessed with wonderful skin; even when she was in her 80’s people commented about how much younger she looked. I’m lucky enough to have inherited that wonderful skin trait from her. I’m in my 60’s and look much younger. But we can all still use a bit of help and I love serums. The ingredients sound great! I have been looking for a reasonable Retinol Cream. I have got to give this a try. December 8, 2018 @ 2:24 pm Lyndsey R.
I love that it is really gentle. Sounds like a great product. December 9, 2018 @ 1:54 am Paula S.
This looks like exactly what I need. My skin is starting to show the signs of aging!